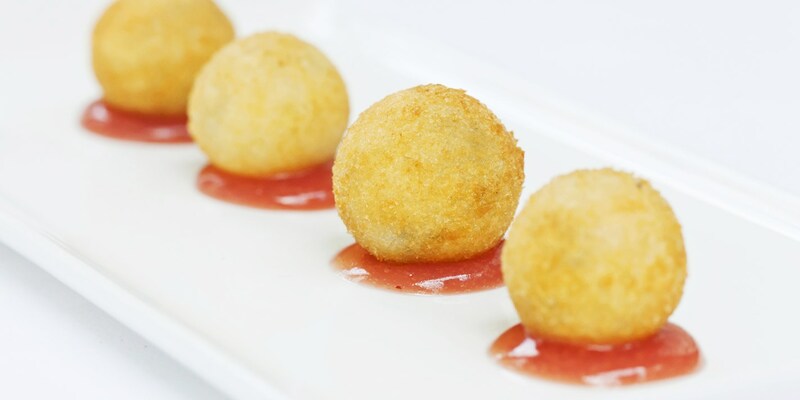 Panko are a Japanese brand of breadcrumbs, widely used by chefs to create a lightly-textured coating on anything from Scotch eggs to schnitzel. Traditional Western breadcrumbs are very fine, meaning that they form a more dense, tightly-compacted layer, while bigger, looser-cut panko breadcrumbs create an airier, more textured casing. The most authentic use for panko breadcrumbs is a Japanese pork tonkotsu, which is a schnitzel-like dish dating back to the latter part of the nineteenth century. There's no need for chefs to limit the use of panko to Japanese recipes. Such is their popularity, the breadcrumbs are now exported to kitchens all over the world, where they're used for everything from haddock croquettes to pork escalopes. When using panko breadcrumbs to bread food, first create a nice dry surface on the item being breadcrumbed by dusting it in seasoned flour. Next, dunk it in a shallow bowl filled with lightly-whisked egg. Finally, roll it in the breadcrumbs. For the best texture, deep fry, or at least pan-fry with a generous amount of oil or butter to ensure that the panko breadcrumbs become crisp. Breadcrumbing is a popular technique used in dishes worldwide, from Ukranian chicken Kiev to Scottish haddock fish cakes and Sicilian arancini. Panko breadcrumbs are most commonly used to coat meat or fish, but can also be used to add texture to anything from macadamia nuts to celeriac and truffle beignets and can even add crunch to crumble toppings and brownies.